1. Get at table where the minimum isn’t any more than five percent of your money. 2. 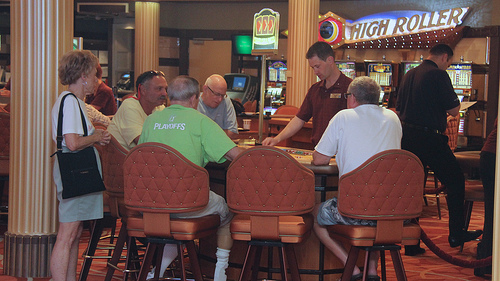 Look for rules that aid players such as being able to double down or a dealer being required to stand on a soft 17. 3. Begin using basics. Dealers have to hit on 16 or less, so you can’t win on 17 unless a dealer busts, so take a card if you have less than 17 if the dealer has high cards. 4. Stand on a hand higher than 11 if the dealer has a four, five or six that could cause the dealer to bust 40 percent or more of the time. 5. Doubling down means you can double the bet and get another card. It’s a good player advantage, especially doubling if you have 10 against nine or lower or a hand with 11 points. 6. If you have two cards that are the same, split them and double the bet and play two hands. Don’t split tens or fives, but do split sevens or eights if the dealer’s cards are lower. Always split aces, but don’t split face cards, fives or tens. 7. Be sure to tip your dealer, although it is not mandatory. 8. Never play if you’ve been drinking. 9. Never think you are having a winning streak. 10. Never over bet or make foolish plays. 11. Don’t play for a long time without at least getting a break, something to drink or eat or at least stretching your legs. 12. There are no hot or cold tables or dealers. 13. Six or eight deck games are better for the player, but players could be cheated in a one deck game if the dealer is not reputable. 14. Automatic shuffle machines make it impossible to track cards, while handheld decks may not be so random. 17. Have a basic strategy chart that explains the game.